The Boring CompanyThe Boring Company will have to overcome concerns from local lawmakers about disrupting existing infrastructure or public transit systems. Elon Musk’s Boring Company has received a permit from the Washington, D.C. government that will allow it to begin some initial digging and other preparatory work in a parking lot about a mile from the US Capitol. The permit represents just the first of many steps that would be required before the company could begin building a tunnel system in the D.C. area. Musk hopes to use the Boring Company to build tunnels for high-speed transit systems like Loop and Hyperloop. 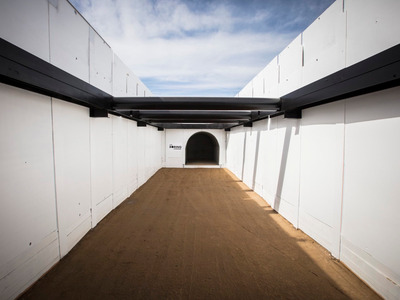 Elon Musk’s Boring Company has taken the first steps toward potentially building a tunnel system in Washington D.C. On Tuesday, the Washington Post reported that the Boring Company received a permit from the D.C. government that will allow it to begin some initial digging and other preparatory work in a parking lot about a mile from the US Capitol. The lot could eventually become a station in a high-speed transit system, according to a Boring Company spokesperson, who added that stations in such a system would be smaller and more “widely distributed” than traditional train stations. The permit represents just the first of many steps that would be required before the company could begin building a tunnel system in the D.C. area, but it indicates that local authorities have some prospective interest in learning more about the project. Given the resistance the Boring Company has faced from local governments elsewhere, that’s no small feat. The Boring Company hopes to decrease traffic congestion and commute times with a series of underground tunnels it hopes to build across the US. The tunnels could one day house the Loop transit system, which would use electric skates to transport commuters and cars at up to 150 mph, and the high-speed Hyperloop system, in which commuters would travel in pods that could move at over 600 mph. A Hyperloop system could allow commuters to travel between Washington, D.C. and New York in 29 minutes. The company has received permission to dig a tw0-mile test tunnel in Hawthorne, California and a 10.3-mile tunnel in Baltimore beneath the Baltimore-Washington Parkway. It has also discussed building a tunnel between Chicago and O’Hare International Airport with Chicago Mayor Rahm Emanuel. In July, Musk tweeted that he had “verbal” government approval to build a Hyperloop that would connect New York, Philadelphia, Baltimore, and Washington, D.C., though no formal announcements has been made. Getting approval for a full tunnel system in a major city may be the Boring Company’s biggest hurdle, as it will have to overcome concerns from local lawmakers about disrupting existing infrastructure or public transit systems.